And I have to tell you that I think -- and I hope I'm wrong about this -- but it appears to me that we still have a whole lot of people who do not understand what we are up against. Now, I only understand it because I have the benefit of three decades of experience. This Green New Deal thing that they proposed yesterday is no more outrageous and no sillier and no more impractical than anything they have been proposing, particularly on climate change, for the past 30 years. In fact, when that first came up, I sent one of the Snerdleys to the nearest McDonald's in Manhattan and bought $5,000 worth of Big Macs and Quarter Pounders to ram it down their throats. It was Mario Snerdley, and he took a phone, and he was reporting the purchase, he shows up, wants to buy -- I don't know how many it was -- but it was many more than they had. And it was great fun and a great bit. It was all to illustrate the absurdity of these people on the left. And yet 30 years later, what has happened? The Democrat Party now has actually proposed it in a serious way! And it has serious support from more Democrats than you would believe. And I'm telling you, I made a speech at an anniversary dinner at the Media Research Center, and they played, as they always do at these annual events, they played video of some of the most outrageous, silly, stupid, offensive, unimaginable things said in American Media over the past year. \And as each one aired the audience laughs uproariously. I'm backstage listening to all this. So when I went out and it was time for me to go speak, I kind of wagged a finger at 'em and I said, "Yeah, this stuff is funny and it's dangerous and it's ridiculous and it's solipsism, it's all of this. But don't think for a moment they don't believe this. They believe every word of it. They do not think it's ridiculous. They do not think it's funny. They're not just saying a bunch of meaningless stuff for the sake of being true to some cause. They literally believe this." Now, let me tell you about Alexandria Ocasio-Cortez just so that you can keep some of this in perspective. And, yeah, I'm gonna deal with this somewhat seriously. I've had my fun with this for 30 years, and I'm telling you: That hasn't worked. Not when the Democrat Party is being open and up front about what they want to do to this country. It used to be fringe. It used to be extreme. It used to be wacko. It used to be blatantly insane nuts. Now it is mainstream, and they're leading with it, and it's who they are -- and the reason they're doing that is because they think they can win elections with this stuff. They do not think that this is going to be harmful or detrimental to their efforts to win elections. They think it is a fundamentally required aspect of their agenda, and not just the Green New Deal stuff. Printing money, all of the economic insanity, they believe this stuff. And Alexandria Ocasio-Cortez has a whole bunch of "brain guards" -- that's what I call them -- on Twitter. She has a couple of million brain guards. Her Twitter followers eagerly defend her from every stupid utterance that she makes. She is shielded and protected from this stupidity and naivete. They prop her up at every opportunity. Whereas she might learn from failure and might learn from some of these mistakes, she's not given the chance. They prop her up. They continue to fill her with this head-expanding, head-swilling idolatry to the point that she is approaching (in her own mind) goddess-like status. She literally believes. No matter how stupid we think it is, how dangerous we think it is, how ignorant and how laughably unbelievable we think it is, she believes it. * And she's got these two million Twitter followers that back her up and prop her up and rationalize her with every one of her utterances. * Some people might think, "Well, that's good, Rush. * An ignorant, spotlight-loving, clueless fool who the media promotes as the face and future of the Democrat Party will have a short shelf life." Well, in a sane world governed by common sense, that would be the case. * And at some point, some might say, "Rush, this is so bad, this is so embarrassing, that at some point the media is gonna be embarrassed and is gonna take her down. "* We're nowhere near that yet. * We've even got Sam Donaldson today now espousing the wonders and the compassion, the genius and brilliance of socialism. * Another Democrat, Jeff Merkley, was asked about it. (paraphrased) "Hey, I love this! 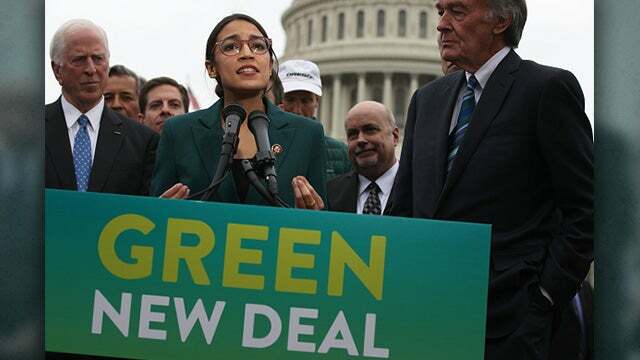 The Green New Deal and socialism..."
She's got four Democrat presidential candidates who have endorsed it. * I don't care whether they've seen it or not. It doesn't matter. * They are on board because they know that that's what the Democrat base wants, and Jeff Merkel... Do you know what he said socialism is? * This is an elected Democrat in the Senate, Jeff Merkel. He says (paraphrased), "Well, I'm all for socialism. * Socialism is the finest system we have developed to take care of our seniors, and Donald Trump is trying to destroy it." "Socialism is the finest system ever created to protect our seniors, and Donald Trump is out to destroy it. "* Now, Kimberley Strassel -- who we admire greatly on this program -- had a hilarious reaction to the Green New Deal and tweeted about it yesterday and then crafted a column in the Wall Street Journal. * "1) By the end of the Green New Deal resolution (and accompanying fact sheet) I was laughing so hard I nearly cried. "If a bunch of GOPers plotted to forge a fake Democratic bill showing how bonkers the party is, they could not have done a better job. It is beautiful," and she spends the rest of the time detailing how idiotic, how funny, how devoid of common sense it is. She points things out like: If we're gonna get rid of airplanes and replace them with high-speed train travel, do you realize how many high-speed train tracks we're gonna need to connect every city in this country -- and then what happens to Hawaii?" So everybody is figuring this is hopeless, it doesn't stand a chance, these people are out of their minds. * But, folks, as tempting as it is to laugh -- and with the laughter, to discard it and to not take it seriously because, "(chortling) Who could possibly believe this? "* They do. * Many of their young followers love this. * I cannot tell you the number of advocates for the Green New Deal that you will find throughout Millennial media. 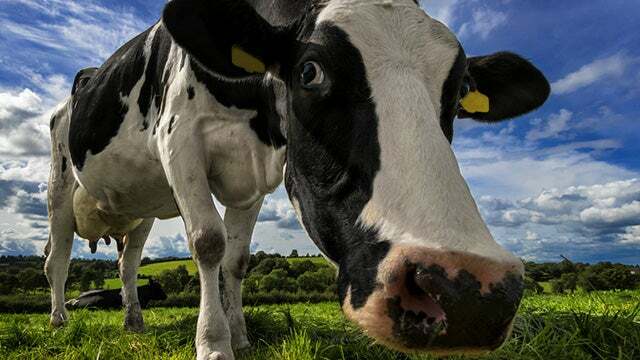 When you get into the details -- banning airplanes and high-speed rail to replace them, ending cow farts in 10 years -- folks, this is what they have grown up being told is destroying the planet! SUVs, jet airplanes, cow farts, methane. * This is what they've been told. * Here comes a proposal to get rid of all this, and they are celebrating, and they are proposed to vote for it, for people that believe in it, and support it. * The Associated Press is trying to make this sensible in their reporting of it, and the Associated Press stories end up in thousands of newspapers, websites, Yahoo News and so forth. * In the Drive-By Media, there's not one word of ridicule of this. You go to Apple News. You go to Yahoo News. You'll find nothing but adulation for Cortez and support for the proposal among people who seek news from those sources. * You won't find any of this be ridiculed -- and I'll guarantee you, Cortez and her band are not reading the Wall Street Journal or anybody there who tweets. * You know, I have been laughing at and making fun of these people for a long time -- and for the first 20 years when I did so, it was with great confidence and comfort that nobody's ever gonna believe this. This is made to order! I couldn't wait to get up and do the radio program every day hoping they would go even more insane -- and here we are in 2019, and they believe it. * They believe it all. * While more and more people think that this is impossible, they believe it all. * So the last few years, I've been trying to get people understand that they believe this. They are serious about this. * Not just the Green New Deal, but everything they're saying about socialism and everything they're saying about transforming and wiping out America as it wasn't founded. They believe it all, and it is a mistake -- it is a mistake --* to assume that the vast majority of the American people are gonna see the folly of this. * It is a big mistake to think that. * I'm not trying to scare anybody, but I just think we need to face this for what it is, because people need to know who these people are and what this stuff really is all about -- and laughing at them is just seen as being rude. * Laughing at them is mean. * Laughing at them is bullying them. RUSH:* Now, look, folks, I'm not trying to be too serious or too dramatic about this, but I'm alarmed to a certain extent, especially as I see this Green New Deal and Cortez and so forth be reacted to. * For example, so many people, including Ms. Strassel, are just blown away by how juvenile the writing is in the Green New Deal. * They're asking, "Did she actually write this folly? * It's written... It looks like a satire! * It looks like what the Republicans would write if they were making fun of it. "This is so silly! These idiots! Whoever wrote this doesn't even know proper language. "* But, folks, I'm just gonna tell you: It was written the way it was and is being pushed precisely to open up all kinds of people to these various premises, that we can ban jet travel, that we can create all of these massive high-speed train networks, that we can stop cows from farting. * This thing is designed to get people to start considering this and to make it almost a defining partisan aspect of liberalism, a litmus test of whether you're a genuine liberal or not. This is the kind of stuff... This Green New Deal is what young college kids love -- and my tech bloggers, they're celebrating. * They think the planet isn't gonna be livable in 30 years and they think finally somebody is taking it seriously and doing something about it. * They're not laughing at it. * They are applauding it! * Get rid of ICE to help pay for this and then just print money? * We have a bunch of spoiled-rotten, uneducated children who are in the process of defining and taking over the Democrat Party, and it's time to stop indulging these little kids. 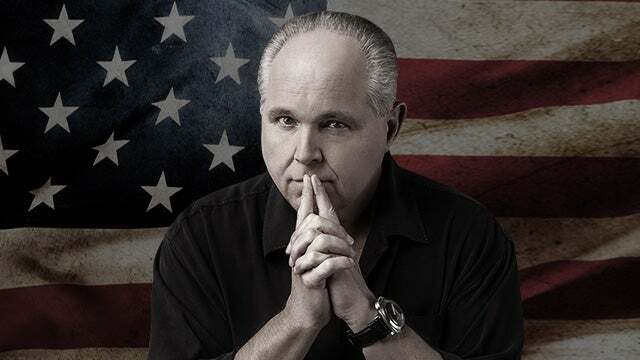 RUSH: *Folks, H. L. Mencken from Baltimore (I'm gonna paraphrase) once wrote, "No one ever went broke underestimating the ignorance of the American voter" or "the American public. "* You've heard variations of that: "Nobody ever went broke thinking the American people are dumb or dumber. "* It's a bit of a cliche and I know that it is insulting, but it is exactly what is happening here. * Now, where did all this stuff start? * Why do all these people believe this? If you want to go back and trace it, I would tell you that be you need to go all the way back -- with this generation, with Ocasio-Cortez and maybe some years older -- to Captain Planet Saturday morning cartoons, Ted Turner. And then the piece de resistance is Algore's stupid movie. * Do not doubt me on this. * It got an Oscar. * It wins Academy Awards! * He was a hero! * These people grew up believing every lie and distortion that was in that movie. The environmentalists have been brilliant. * They have told people, "You're gonna die! * This earth is in the process of being destroyed! "* Not damaged, destroyed. * "We're already killing the polar bears. "* They think that. * You can tell 'em, "No, the polar bear population is at an all-time high. "* They don't believe you. * They've seen the pictures in Algore's movie where there aren't any glaciers anymore for the polar bears to sit on. (sobbing) "The polar bears' habitat is literally melting away! They're dying off! It's horrible. "* They really think islands have already been erased by rising sea levels. * They're convinced that Miami will not be here in 10 years. * There's no substitute for experience, and I have been doing this for 30 years. * I've been tracking this issue, and I have been tracking the people who believe it, and the people who believe it are getting more strident and stringent in their beliefs. Now, I know the polling data shows that most Americans don't even care about climate change as a political issue, meaning something on which their vote turns. * Is that stopping these people? Look at the damage they've already done to our culture. * How many of you ever thought that gay marriage would be overwhelmingly accepted inside two years after the big push began in every state in the country? * How many of you ever thought that we would really have serious debates on whether men can use a woman's bathroom or a little girl's bathroom? I mean, they're creepy, sneaky smart, creeping up to everybody, building up to the resistance and bullying the opposition to this. * And so, you know, laughing about it and trying to joke about it? I've tried that. * It is so deeply inculcated in them -- propagandized, indoctrinated into them -- that if we don't take this seriously and swat this down and slap it back... I've got so many people saying, "Rush, this is the greatest thing that's ever happened. This is the best thing in the world for the Republican Party. "This Green New Deal is the greatest thing since Trump's election. * It is so stupid -- and Cortez is so smug spelling out what the Democrats really want to do to us -- that this thing has no prayer of happening and it's gonna really wake up a bunch of people on the left. "* I know...* This is a great example. * A lot of people are thinking, "There's no way -- there's literally no way -- they're gonna get enough people to literally think we can ban airplane travel in 10 years." Do not kid yourself. * I predict you're gonna end up being shocked at how many people the media at least says support this. * You're gonna see the first polling data on this, and you're gonna be stunned and amazed. * You can't believe it. * You're not gonna believe it. * I don't know whether the polls are gonna be legitimate or doctored or not. But it is really important to understand that they're now leading with this. * They're not trying to do this stealthfully. There's no pushback against them. There's no demand that they resign. There's no public outcry or outrage over it that we know of. Because if there is, the media doesn't cover it. (southern accent) "Right now, our old buddy Ralph No'tham is being credited in the media for surviving his scandal. * You know how? * The media sayin' what a brilliant maneuver Ralph No'tham has made by goin' invisible. * The media is praising Ralph Northam for being able to hide from them." Nobody can hide from the media unless they want to not find somebody. * So they're already saying (impression), "Ralph Northam done gonna survive the blackface scandal," meaning Ralph Northam's gonna survive his belief that babies can be wiped out after birth. * Nothing's gonna happen to the New York state legislators who passed the same law -- and I think it's New Mexico, they've got a law now that's even worse than those two. And all the while, all these people say, "Aw, that's never gonna happen, Rush. * You gotta stop talking about abortion, Rush! Nobody's ever going to do that. You're getting people hate us. They think we're a bunch of God-loving, card-carrying, Religious Right kooks. * You gotta stop talking about it. "* I'm telling you, folks, it's headed in the wrong trajectory. * So you never... I guarantee you that nobody in this audience... Maybe some of you. * Maybe. But how many of you actually thought that you would be alive when a political party in state after state after state advocates for killing babies after they're born on the basis that that's what the mother wanted to do and you can't tell the mother what she can or can't do 'cause it's her body, it's Roe v. Wade, and you gotta shut up about it? How many of you would have ever thought that anybody in a political party would benefit from that? * But yet, here we are. RUSH: We'll start with Tim in Dallas. Great to have you, Tim. Welcome to Open Line Friday. Hi. RUSH: Well, we have. Now, that's a good point. Here's the number one preacher for the presidential candidate from the Democrat Party, and he's out there proudly saying "G.D. America" and the media is trying to cover it up. Now, Obama was elected because of race. Obama got a plethora of votes from white people who believe that they were helping to end the whole concept that America is a racist country by voting for the first African-American presidential candidate. In their minds, what could be a bigger statement that we're not this racist nation, the Democrats say, than by electing an African-American? What happened after that? Race problems got even worse. Why? Because it's not possible to fix the problems the Democrats say we have. There is no solution because the country was founded with them. The country as it exists, therefore, is immoral and unjust, and it cannot be fixed. And everything flows from that. I'll tell you something else in this Green New Deal stuff. How many times, starting in – the first time I heard this was -- and it predates this, 1993. 1992. Sorry. The '93 year was the year Clinton was inaugurated. 1992 campaign, and Clinton's running around, "This the worst economy the last 50 years" and all this stuff, and there was a bunch of controversy attached to Clinton in terms of philandering and all this and I had people call here and say, "Rush, this is perfect. This is perfect. We need to lose this election. 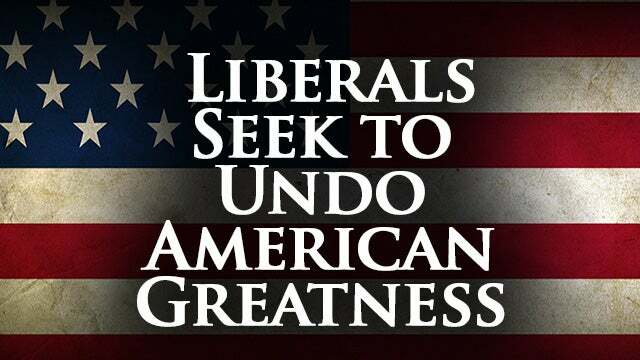 We need to go ahead and lose it and let people find out just how bad liberalism is." Remember that? We still have people believing that to this day. The way it manifests itself today, "Rush, get out of the way. When a fool's making a fool of himself the best thing you can do is stand aside and let it happen." Well, these people in the Green New Deal are no doubt making fools of themselves, to us. But I have yet to see this strategy work. "Rush, let's just let the population see how bad liberalism is. Let's let 'em see how damaging." How damaging liberalism is? There hasn't been a success story associated with socialism or communism anywhere else in the world, and yet the Democrat Party is now officially all-in on the premise that socialism needs to be enacted, implemented, and replace every vestige of the American founding, particularly those things that are rooted in capitalist economics. The American people have seen how bad socialism is, Soviet Union. They've seen how bad it is in Cuba. They've seen how bad it is in Venezuela. Democrats still get votes. They still get one hell of a lot of votes. And where do those votes come from? New York, California, Oregon, Washington. People in those states believe this drivel, folks. Have to take a break, sadly. I hate to take a break when I'm on one of these rolls, but there's nothing I can do about it. 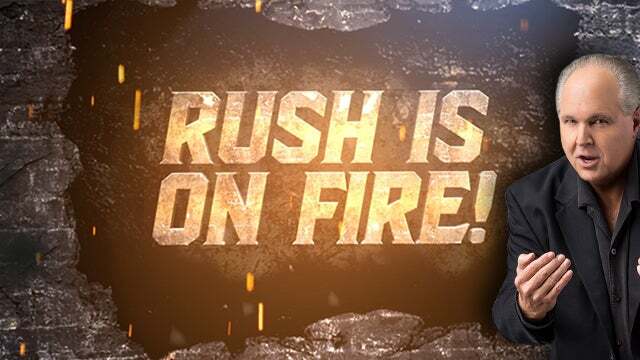 RUSH: I hear you! I hear all of you. You're talking back to the radio. Some of you may be even shouting. "Okay, then what do we do about it?" That's a good question. What do we do about it? What we do about it is create a massive and much larger voting bloc of opposition to this by seriously explaining to people what this will mean if it happens. I'm not saying that humor is something that should be taken out of the equation by any stretch of the imagination, but it has to be dealt with seriously because they are serious.